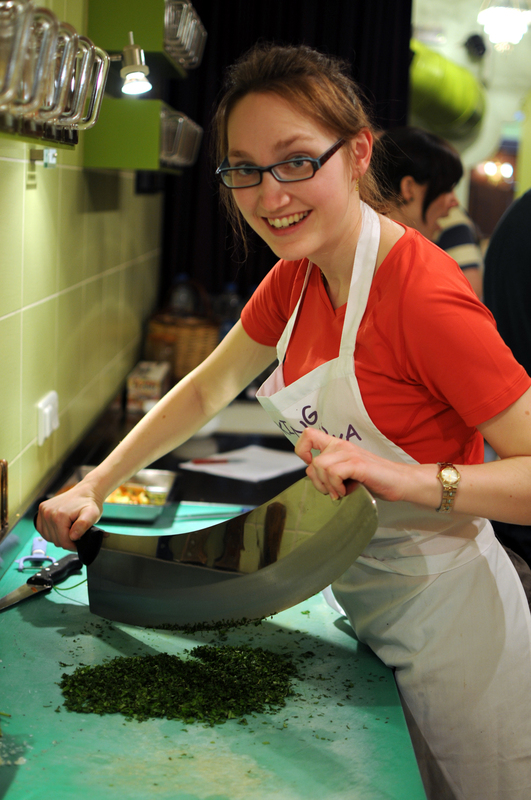 While travelling in Turkey, one of my highlights was a cooking course in Istanbul through Cooking Alaturka. The class was a great introduction to both Turkish cuisine and culture. Run by Chef Eveline Zoutendijk, an expatriate Dutch who trained at Cordon Bleu in Paris, as well as Feyzi Yildirim, a Turkish chef, a group of 10 helped to prepare 5 traditional Turkish dishes: Spicy Lentil and bulgur soup with dried mint and red pepper (Ezogelin Çorbası), Green beans in olive oil (Zeytinyağlı Taze Fasulye), Zucchini patties with herbs and cheese (Kabak Mücveri), Lamb stew in tomato sauce on smoky eggplant puree (Hünkar beğendili kuzu) and Walnut-stuffed figs in syrup (İncir Tatlısı). The venue was perfect for our class. 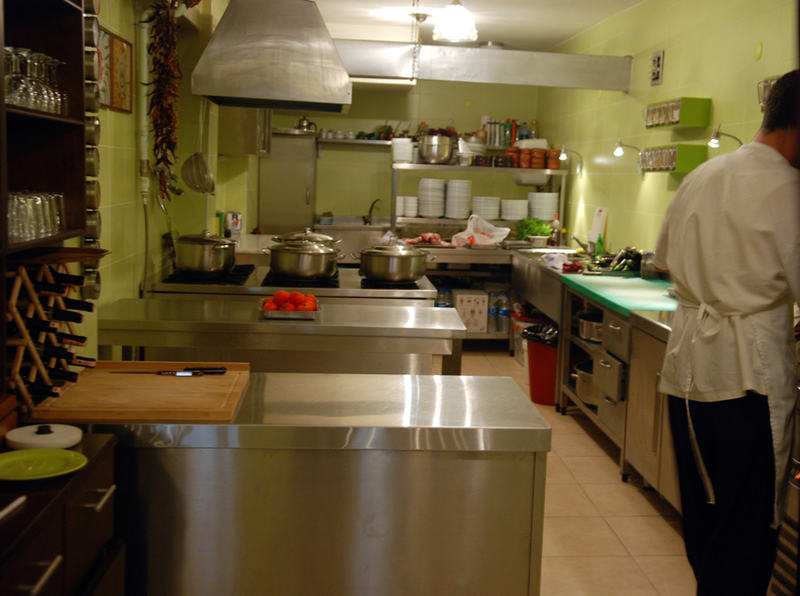 In fact, Chef Eveline designed the kitchen specifically for cooking classes when creating her own restaurant. Chef Eveline leads the majority of the instructions but Chef Feyzi teaches us more hands-on techniques. Both have made this a fun, yet informative cooking class. Chef Eveline’s culinary school background was evident in her teaching – this wasn’t just thrown together for tourists. This was a hands-on cooking class. However, we didn’t each create every single dish. We shared in the prep work and then came together to create the main meals. My task was to chop red peppers for the lamb stew, which look surprisingly like chili peppers, but that’s what they look like in Turkey: slim, in all their glory. 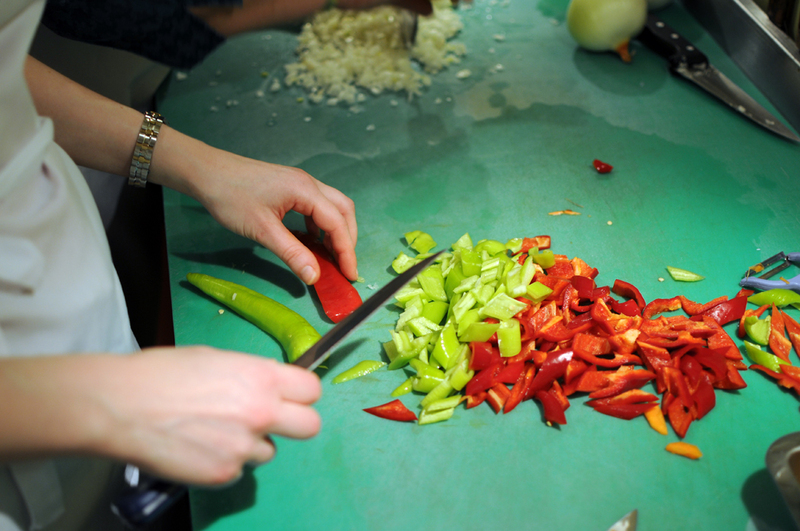 Chef Feyzi showed me how to chop the perfect pepper, with a slight diagonal. 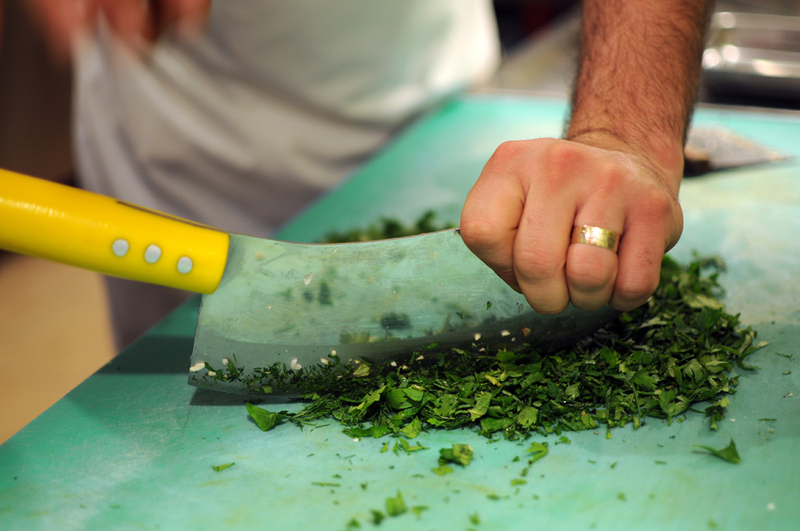 Afterwards, I used a huge zirh, the Turkish equivalent of a mezzaluna, to chop herbs for the zucchini fritters. 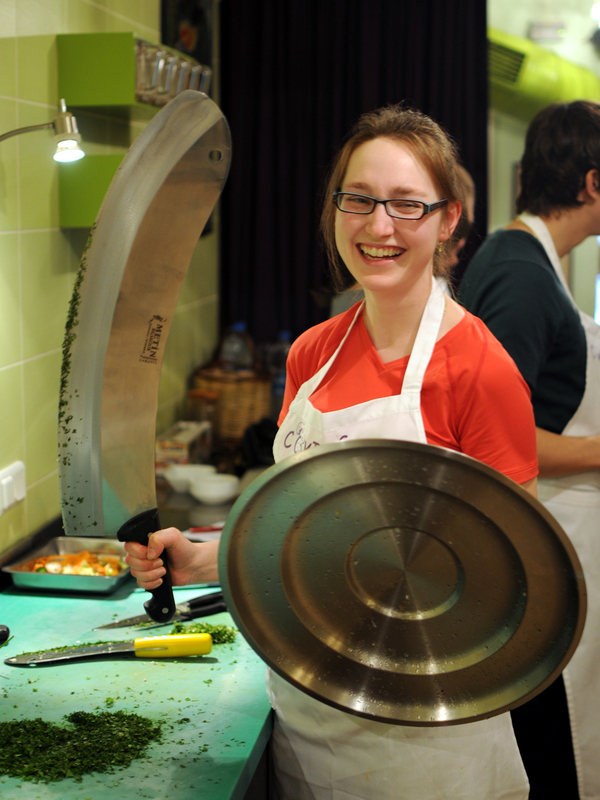 Armed with the lid from the pot, I became a kitchen warrior! Later, I mixed everything together and grilled the fritters on the stovetop. 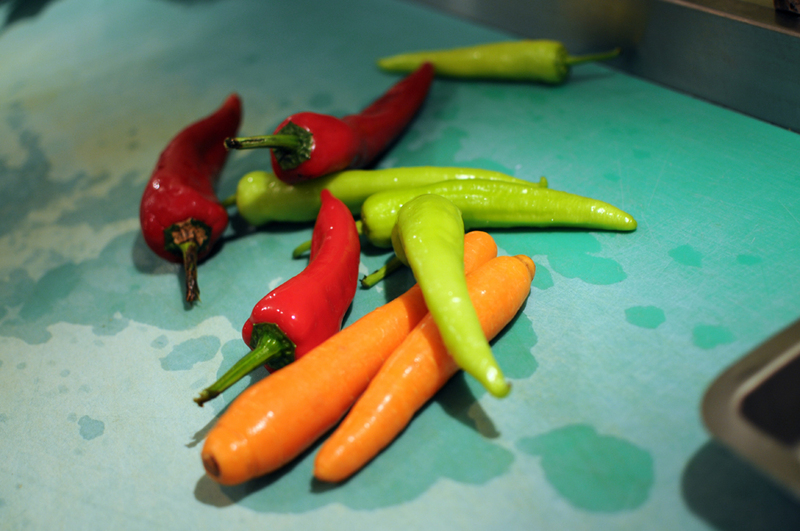 Chef Feyzi watched very intently – “too small!”, “too much oil!” he proclaimed, yet they all turned out delicious. Others helped to blanch tomatoes or chop the green beans for other dishes. We each peeled our own charred eggplant and stuffed our own figs with walnuts, ready to be poached for dessert. Each dish was fabulous. My father thought this was the best meal we had during our entire trip in Turkey. 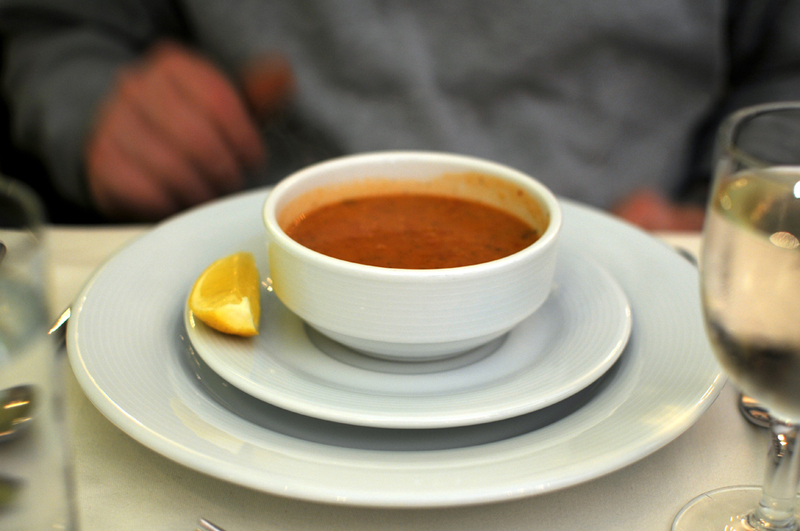 He really enjoyed the Spicy Lentil and Bulgur Soup, which was more spicy than what we had elsewhere. Chef Eveline explained that the recipe originates from southeast Turkey, where they like a bit more heat with their dishes. This soup has a very nice textural component, with cooked lentils perked with bulgur, in a spicy broth flavoured with tomato, red pepper and a dash of mint. Delicious and easy to make. Chef Eveline told us to pick up some red pepper paste at the Spice Bazaar before we left Turkey, but I wasn’t able to fit it into my schedule. I looked at other grocery stores throughout my trip, with no luck. I determined it was an ingredient found mainly around Istanbul. 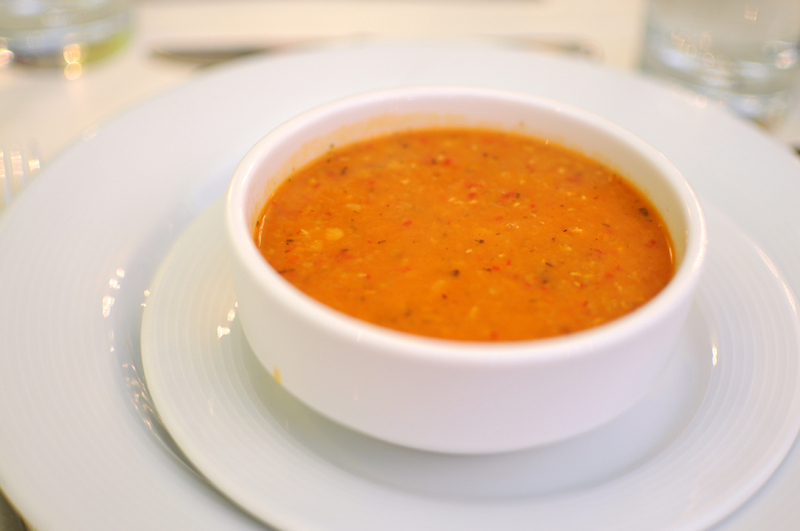 After I found red pepper paste at Marche Istanbul, I knew I had to recreate the soup at home. 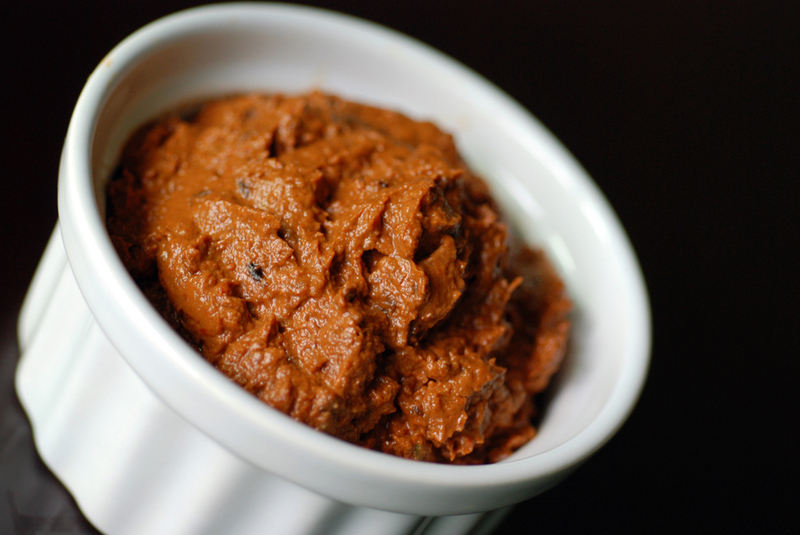 Even if you can’t find red pepper paste, you can substitute more tomato paste instead. You can also make your own. This is my submission to this week’s Blogger Secret Ingredient event, featuring bulgur, hosted by Healthy Exposures, and I am also sending this to Deb for this week’s Souper Sundays. I normally don’t go to the trouble of a meal with lots of side dishes, as I prefer one-pot wonders. I like to have a complete meal in one dish. Rather, I like to cook this way as I find it easier. Perhaps I am lazy and don’t want to make many dishes that need to be timed to finish at the same time, or maybe because I really don’t like to clean dishes. I am glad that I wasn’t intimated by the long list of ingredients, steps and components of this dish. Because it was phenomenal. I have been investigating unique ways of cooking rhubarb and this did not disappoint. Each component was outstanding on its own and together they were simply divine. 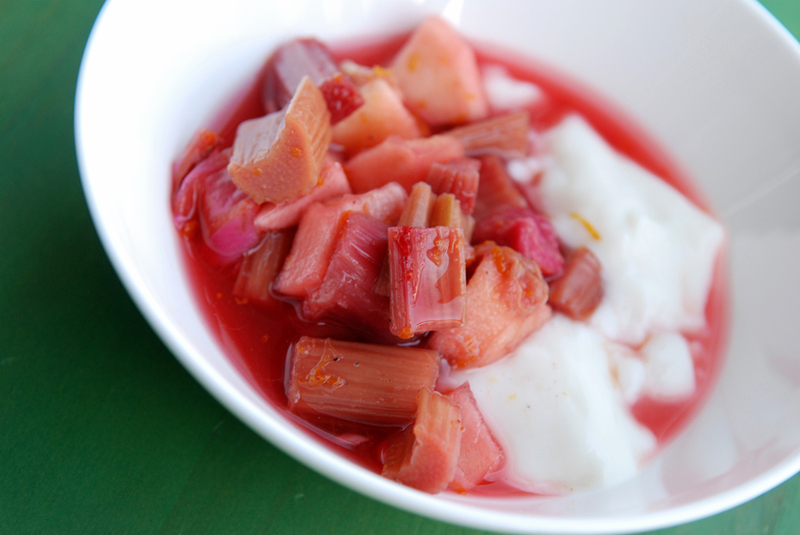 First, the rhubarb sauce is zesty: sweet, sour and pleasantly spicy all in one. 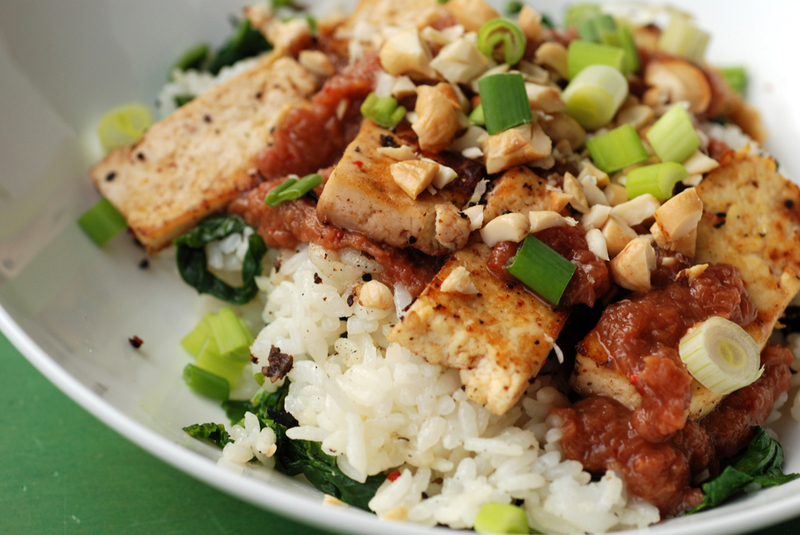 Ginger, chili flakes, garlic, soy sauce and honey work really well together. Second, we have crisp firm tofu that has been marinated in a sweet and savoury sauce including allspice, ginger, and chili flakes. I have fallen for allspice recently and absolutely love it. This is served over a bed of rice that is combined with wilted kale, and as you use the same pan from the tofu, any brown bits (=flavour!) 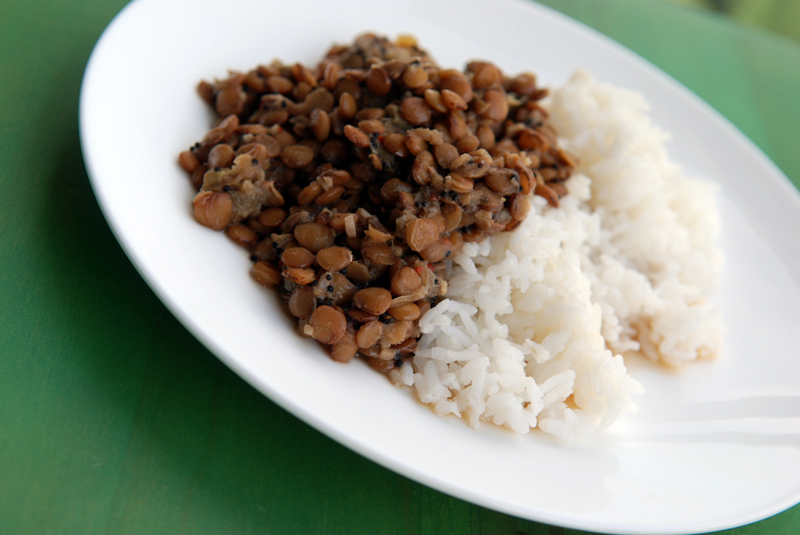 get included into the rice mixture as well. Topped with chopped cashews and green onions, this is a very tasty dish with many complex textures and flavours. 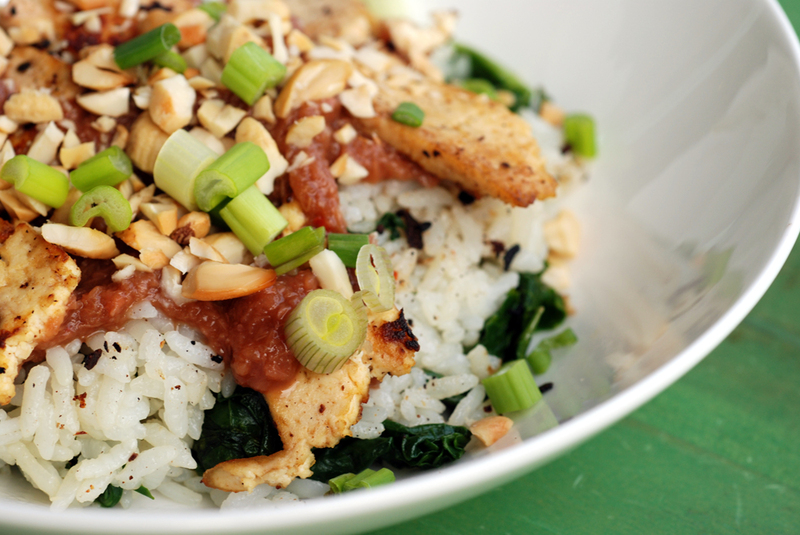 This recipe was adapted from Mostly Eating, who adapted it from Jamie Oliver’s Hot and Sour Pork recipe. I am a bit late, but we’ll see if Ricki can add this to her SOS Rhubarb round-up (I can’t wait to see what everyone else made), as well as to this month’s Cooking with Seeds event featuring pepper. Earlier this month, I was challenged to think of savoury ways to use rhubarb through Ricki’s SOS challenge. I posted a few recipes with rhubarb this month, including an Indian Lentil and Rhubarb Stew, but my mind kept wondering what else I could do with the rest of my rhubarb. Rustic Fruit Desserts spotlighted two different rhubarb compotes, including a raw rhubarb compote where raw rhubarb, sugar and fresh orange juice meld for 6 hours on your counter for a tasty snack. While I didn’t make the dessert, my curiosity was peaked about raw rhubarb. I subsequently stumbled upon a raw rhubarb salad with cucumber and mint in Paula Wolfert’s The Slow Mediterranean Kitchen, although there was nothing slow about this recipe. A bit of salt is added to temper the rhubarb and within ten minutes, you have a savoury salad ingredient – not at all tart! 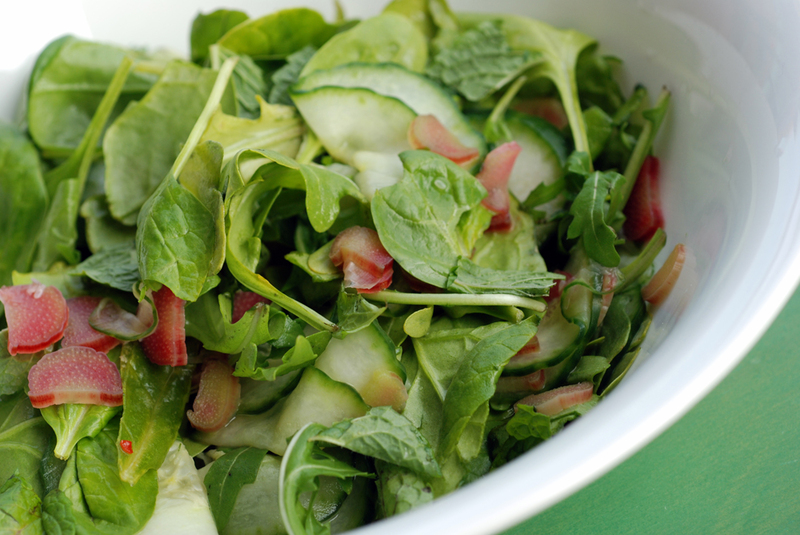 The rhubarb is mixed with thinly sliced cucumber, baby arugula and spinach, squirted with lemon juice and topped with shredded mint leaves. 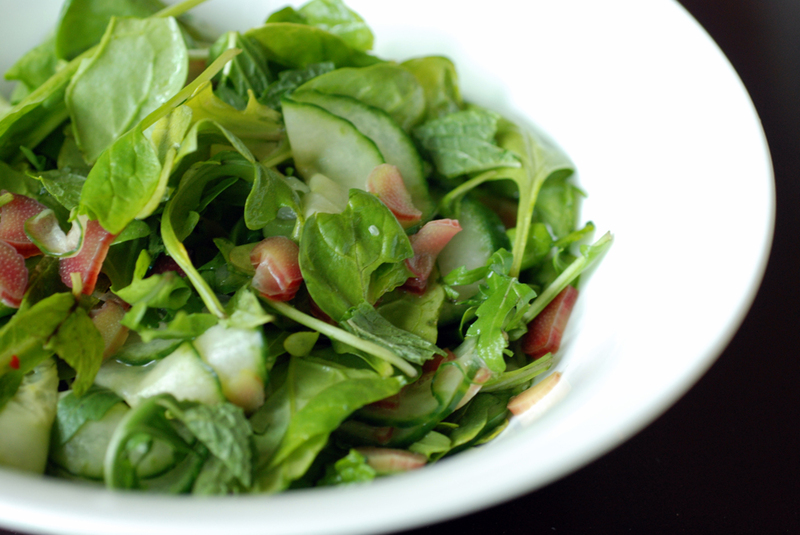 It is a wonderfully delicious, simply refreshing salad. 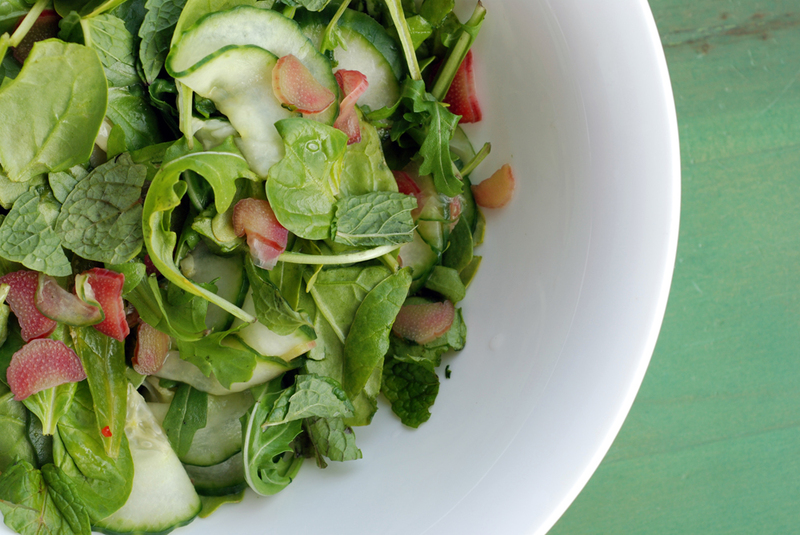 Simple ingredients go a long way for an easy salad for the summertime. Do not shy away from raw rhubarb. Succumb to it. 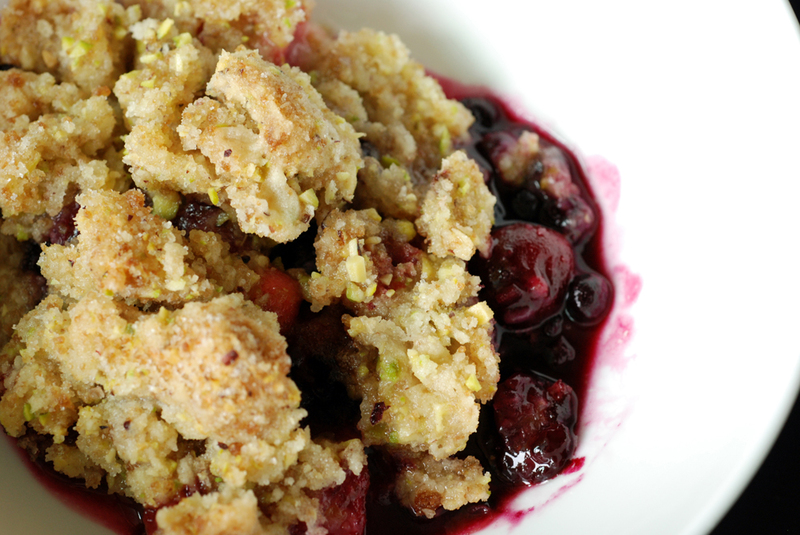 You will be pleasantly surprised at rhubarb’s versatility. I have a love/hate relationship with restaurants. I love trying new foods, but hate the heavy cost, of both funds and calories, that typically go hand-in-hand with restaurant meals. Plus, as I get more adventurous in the kitchen, I feel that I can make it better, cheaper, and healthier if I have the time to experiment. A year ago, I thought Japanese cuisine was impossible to make in my own kitchen, but after getting a few staples, it is easy to make tasty Japanese meals at home. This post is all about the carrot-ginger-miso appetizer salad you find ubiquitously in Japanese restaurants. I never thought of making it myself until I saw it on Smitten Kitchen, who proclaimed it to be the best salad after adapting it from Gwyneth Paltrow’s GOOP.com. 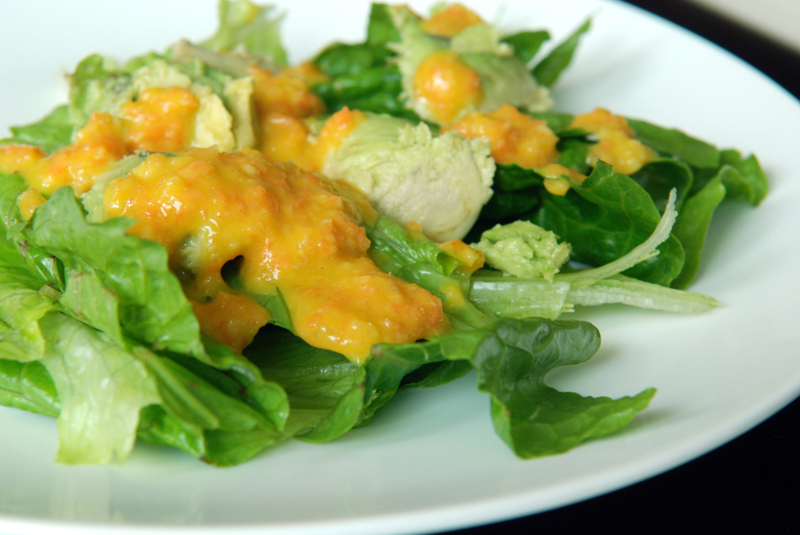 Whiz together a couple of ingredients in your food processor or blender and you have a silky, spicy, creamy, zesty and salty dressing in one. 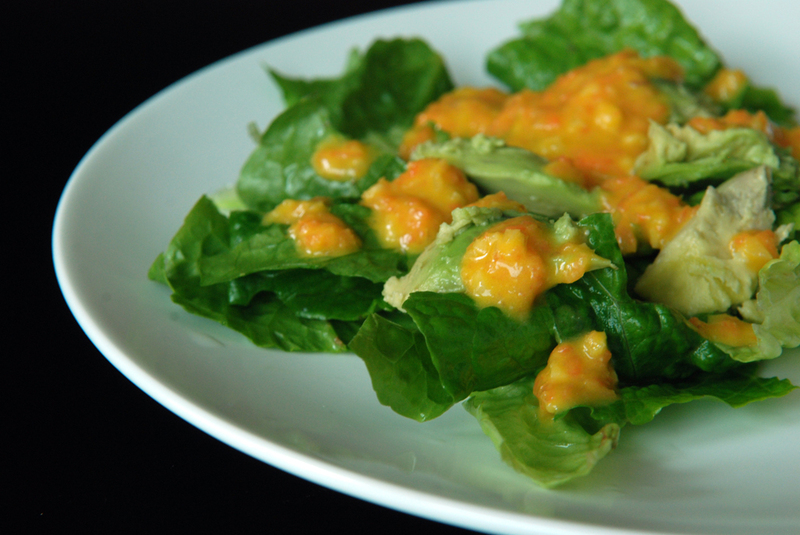 Use it to top lettuce and avocado for a wholesome, delicious, complex veggie treat prior to your main meal. This is my submission to this month’s Veggie/Fruit A Month featuring avocados, to this week’s Weekend Wellness, to this month’s Vegetable Marathon featuring carrots as well as to Deb for this week’s Souper Sundays (which also includes salads). Other than cooking/baking/eating, another one of my new passions is cycling. A year ago I was using my 19-year old mountain bike (it looks like this one on Craigslist) for commuting to work. A year later, after saving my money from a lack of bus passes, I purchased a snazzy road/hybrid and I have been flying ever since. A nice, light bike makes a complete difference and I went from enduring cycling to really enjoying it. My newest cycling goal is a double imperial century ride between Ottawa and Cornwall in September with my family. I have been slowly working my way towards the grueling 100 mile (162km) bike ride for each day. This weekend, I cycled between Burlington and Niagara Falls with a group of friends through the Toronto Bicycle Network. Our my first day, I cycled 128km and almost cried when I arrived at the falls, glorious in all its splendour, complete with a rainbow, but mostly proud of my achievement. 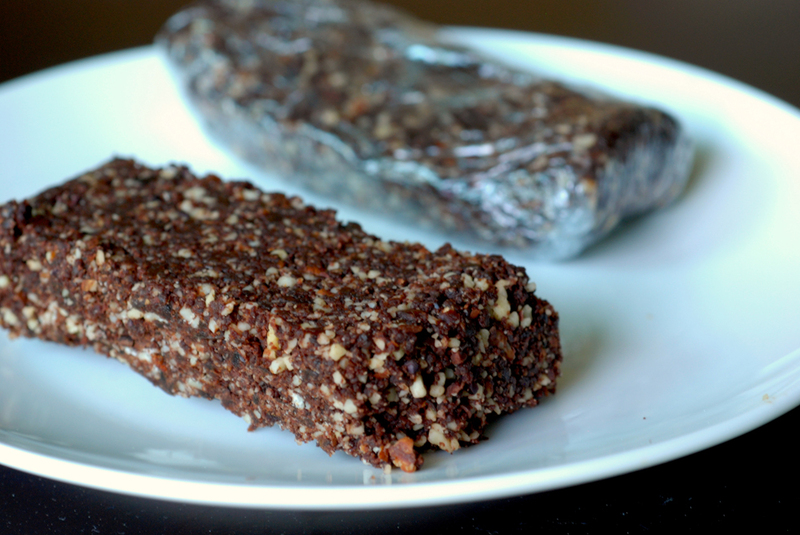 One of the snacks I munched on through the day were homemade almond chocolate Lärabars. 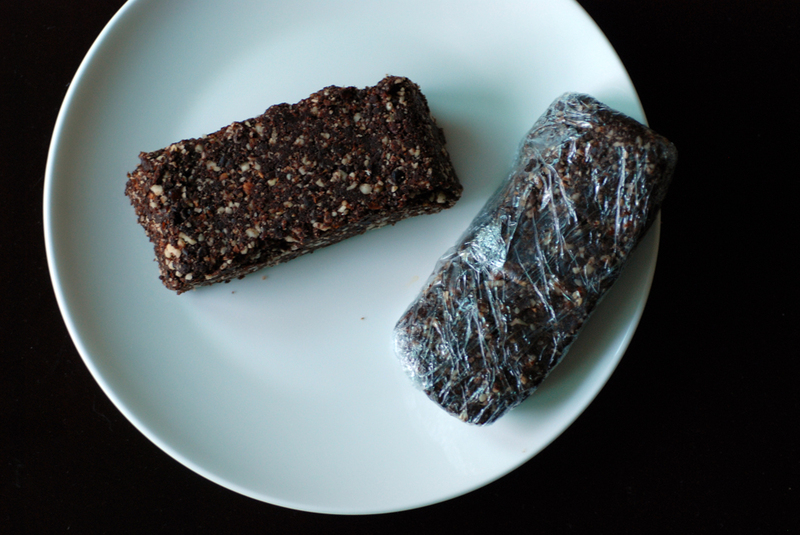 The ingredient list for Lärabars are surprisingly sparse (eg., dates, almonds and bananas) and quite a few recipes are online for many of the different Lärabars flavours (and here, too). In the end, I decided to go all out with Chocolate & Zucchini‘s gourmet chocolate Lärabars with almonds, date paste, cardamom, cinnamon, cocoa, and cacao nibs. They were delicious but a bit crumbly, especially once on the road all day. I think I needed to soften my date paste, which I will do next time. For a while I was confused with the flavours in the bar. It tasted kind of minty but I know I didn’t put any mint in it. I think it was the magic of cardamom. I approve, and will definitely try out other combinations of nuts, fried fruits and spices throughout my summer rides. This is my submission to this month’s Sugar High Fridays, featuring bar desserts. Greece, Italy and Turkey are coastal neighbours so it is quite fitting that across the street from Marche Istanbul is Grande Cheese, a cheese and Italian food “factory outlet”. You know your heart is in your belly when you go to a factory outlet strip and you gravitate to the cheese, spice and tea stores. Anyways, I digress. I promised myself that if I were to buy anything perishable, it would be feta cheese. But Grande Cheese has not 1, but 5 different kinds of feta (I think it was 5, I lost count to be honest)! Egad, I had no idea there were so many different kinds of feta. The lovely woman at the deli counter helped to enlighten me by telling me a bit about each one and letting me sample them. I ended up coming home with a creamy, less salty than Greek, Macedonian feta cheese. Delicious! This recipe was adapted from Closet Cooking and is my submission to this month’s Regional Recipes featuring Greece, hosted by Joanne at Eats Well With Others, and to Priya hosting this month’s Healing Foods featuring onions. While I love oatmeal for breakfast, granola with yogurt and fruit has usurped its position as my go-to breakfast lately. 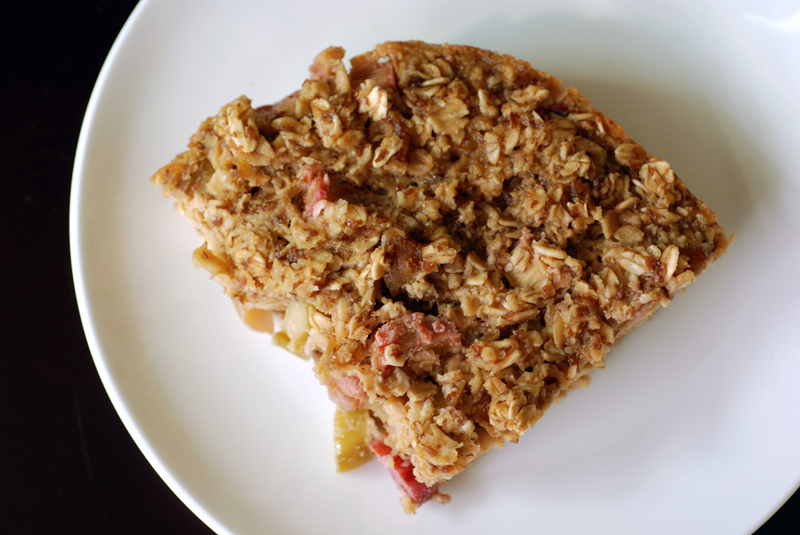 However, when I spotted rhubarb baked oatmeal at My Kitchen Addiction, I knew I had to try it. 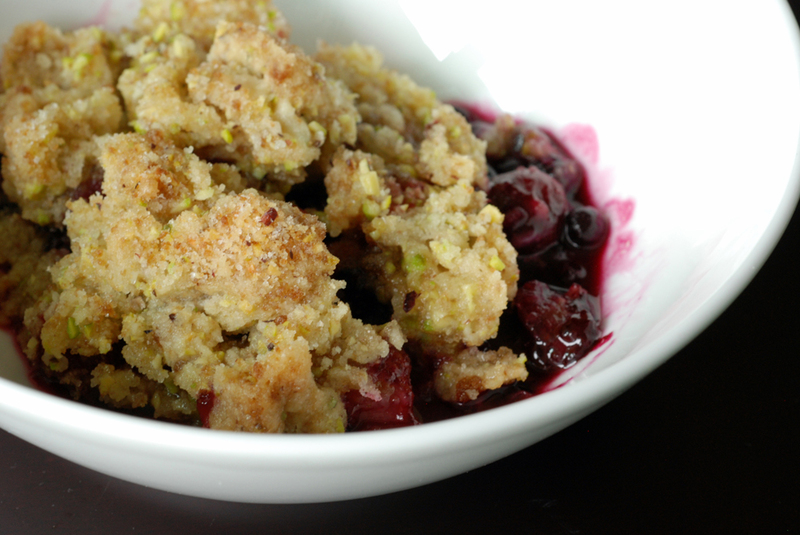 I had no clue what baked oatmeal was, but the rhubarb drew me in. Baked oatmeal is an kind of like a big fluffy piece of creamy oatmeal and in this case, speckled with pieces of soft rhubarb, which brought it to the next level. At the same time, sweet and savory, this breakfast is perfect for the weekend, or for a brunch, where you can pop it into the oven and serve it easily. 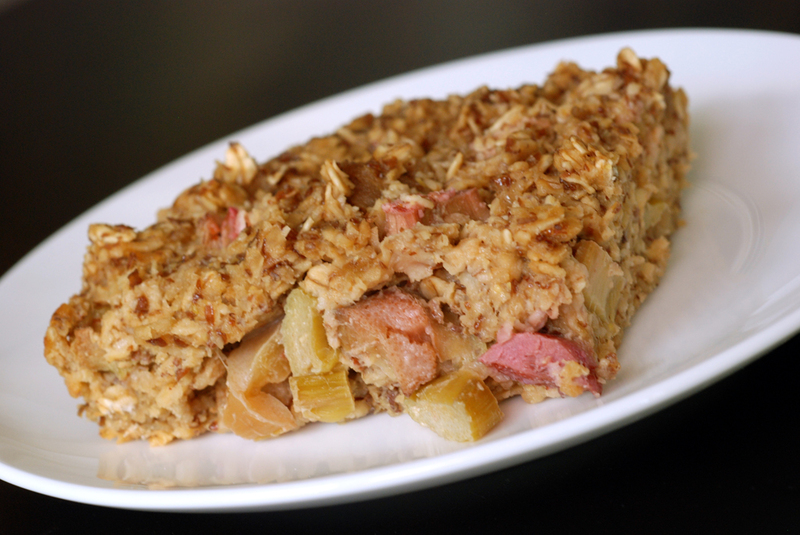 It is relatively healthy with oats, flax and applesauce is used to replace the fat. 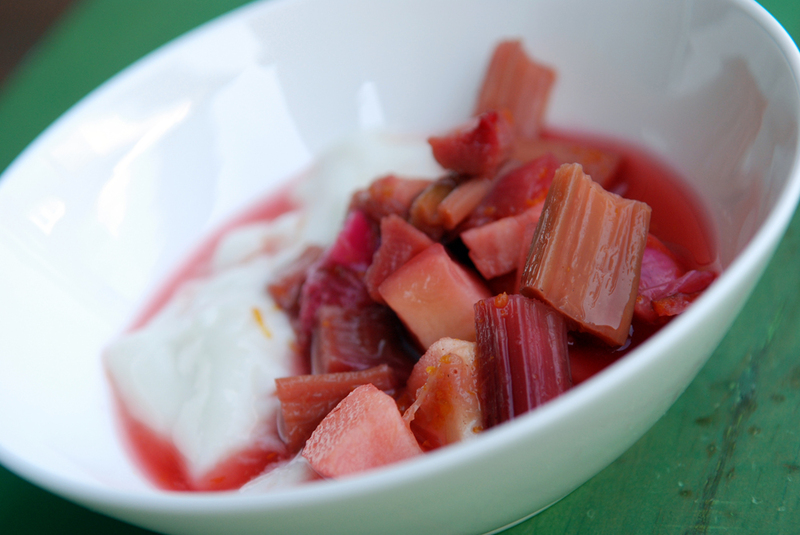 The sugar is needed to sweeten the rhubarb in the dish and it matches flawlessly. For me, the leftovers were perfect as I ate this as a quick breakfast for the remainder of the week. Enjoy! This is my submission to this week’s Weekend Herb Blogging hosted by Rachel at The Crispy Cook. I had been hearing great things about the olive oil granola originally posted by the New York Times, and also spotted on many other food blogs. 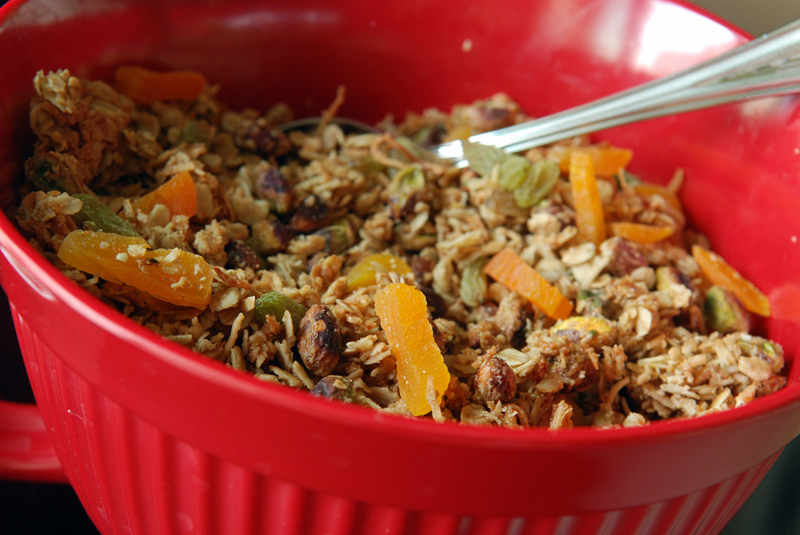 People rave about homemade granola, and then there’s raving about granola! Olive oil granola has a fan club! 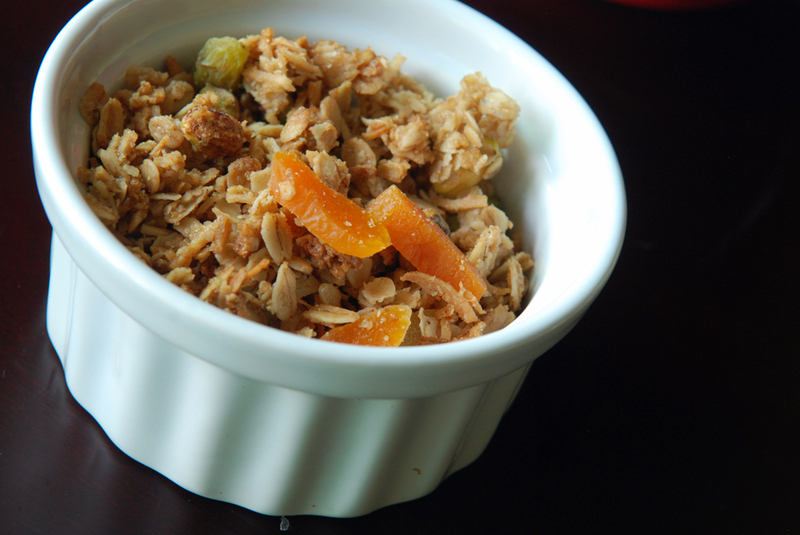 I love eating granola with Greek yogurt and fruit for breakfast, and I am constantly trying new granola recipes. 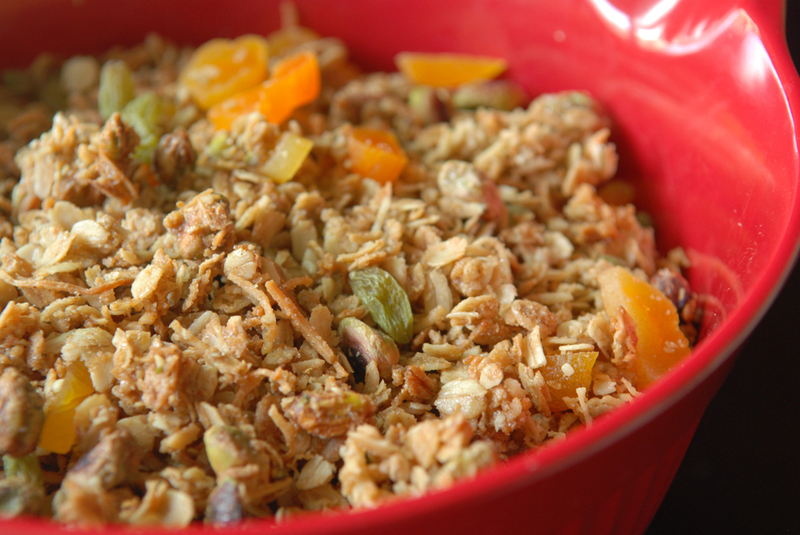 Homemade granola is great because you can modify the flavours to suit your palate. Now that I have started to dabble in Middle Eastern cuisine, do you think this could be considered a Middle Eastern-inspired granola, with its added fixins? 😉 I love dried cranberries, coconut and almonds, which is why they were included in my previous granola recipes, but I rocked the boat to include Turkish dried apricots, Iranian green raisins and pistachios instead. It was delicious! So what is so great about this olive oil granola? It achieves the perfect balance of salty and sweet. I usually don’t add so much salt to my granola, but the salty tang complemented the sweet aspects of the granola perfectly. I also loved the flavour and textural contrasts with the plump apricots and green raisins, with the soft yet crunchy pistachios, combined with the sweet maple syrup and coconut and it was all tempered with a salty kick. 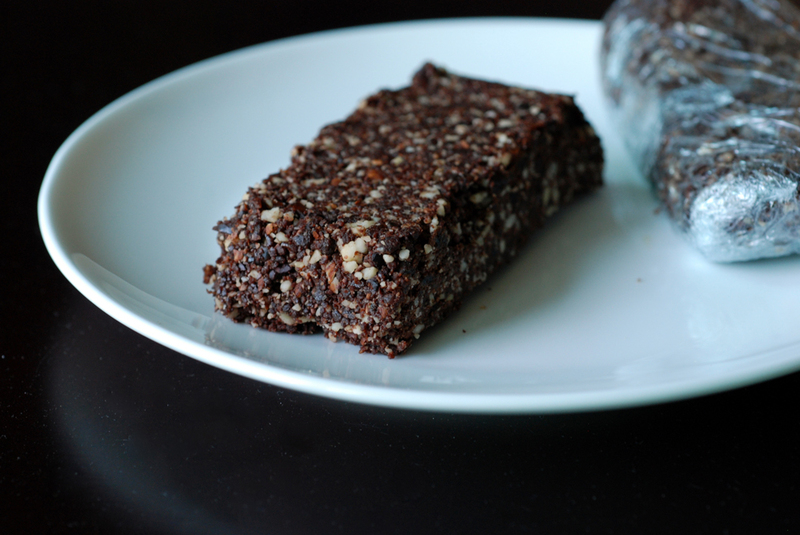 Perfect with yogurt, but also great on its own as a bit-sized snack. Your test will be when you decide to stop munching on the addictive granola! This is my submission to this week’s Weekend Herb Blogging hosted by Anna from Anna’s Cool Finds and to this week’s Weekend Wellness. I went to a Turkish grocery store this weekend and was reminded how much I adore Turkish cuisine. I finally found red pepper paste, which I couldn’t find in Turkey outside Istanbul. I also picked up rose water and orange blossom water. I also know where to go when my Aleppo chili flakes run out. My 200g stash from Safranbolu cost me 2 YTL (~$1.30) and will hopefully last a while, though. I travelled to Turkey for two weeks in April and while the first thing I did when I arrived back was gather Turkish cookbooks from the library, I have yet to cook something Turkish since my return. After my trip to Marche Istanbul, I was brought back to my feasts in Turkey. The food there was fabulous, often from very simple ingredients. I was adamant I would delve back to Turkey in my kitchen. While I quickly associate pistachios with Turkey, Turkey is actually the world’s largest producer of hazelnuts. Hazelnuts, also known as filberts, have a rich delicious flavour and are commonly used in desserts – just think of the fabulous chocolate hazelnut spread, Nutella! In this dish, hazelnuts are used in a savoury salad. They are ground to a paste to form a creamy, lemony sauce. 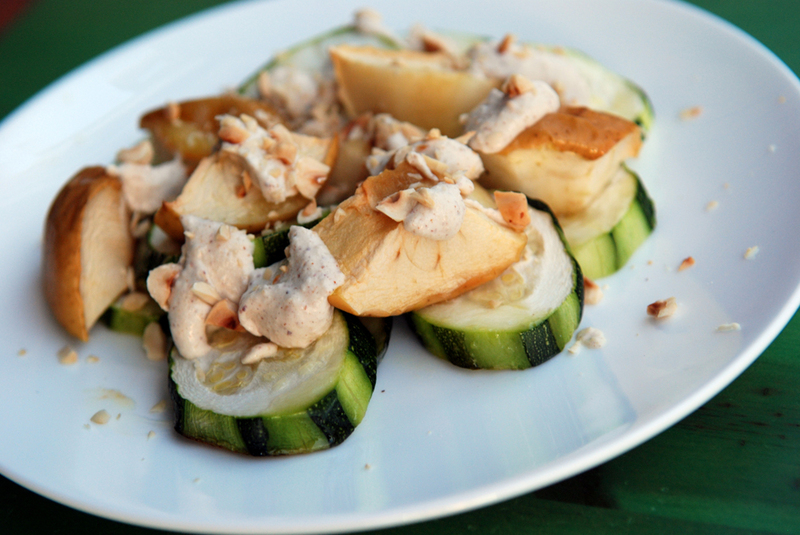 While I didn’t try this dish while in Turkey, I spotted a baked zucchini and apple salad with a lemon hazelnut sauce (taratorlu kabak) in The Food and Cooking of Turkey by Ghillie Basan and adapted it slightly. The winner in this recipe is the lemon hazelnut sauce. It is deliciously creamy with the roasted hazelnuts ground to a thick paste with garlic, and then infused with fresh lemon juice and olive oil. 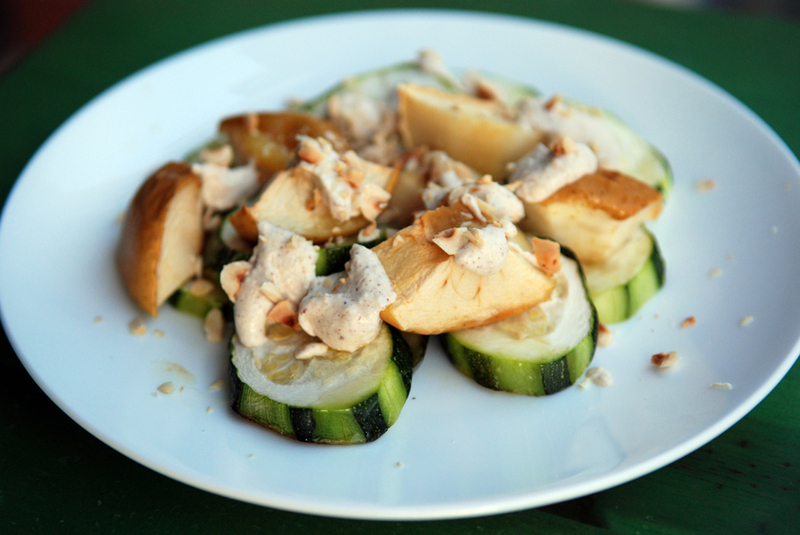 It was added to baked zucchini and apples and then sprinkled with chopped hazelnuts. The sweet apples add a nice accent, and it is paramount to pick an apple that holds its shape after cooking (I used Golden Delicious). As Basan notes, the dressing pairs well with many fruits and vegetables (plums, eggplant, squash, bell pepper, etc). I baked the zucchini and think it was good but it would be even more succulent if the veggies were grilled (says the one without a barbecue). Lastly, I wanted to thank everyone who voted for my Mexican Salad with Creamy Avocado Dressing in the last round of No Croutons Required. I am honoured to have been picked as the May winner, especially as there were many tasty dishes on the menu. This is my submission to this month’s theme focusing on zucchini and to Preeti’s Green Gourmet Event at W’Rite’ Food as well as to Deb for this week’s Souper Sundays (which also includes salads). Zucchini is a very versatile vegetable which is great when gardens are overflowing with zucchini. Sadly, I don’t have a garden, YET. I have a balcony, still devoid of plant life, but no backyard, courtesy of living in an apartment. I was *this close* to signing up for a shareable backyard garden through Sharing Backyards or the Yes In My Backyard through The Stop Community Food Centre. But my mom convinced me not to do it this year as the backyards were a bit further than in my immediate neighbourhood. Our compromise will be a deep dish herb garden for my balcony. However, zucchinis won’t fit in there. It won’t stop me from buying them, though. Adapted from Closet Cooking, this is an interesting way to bake zucchini into fries. 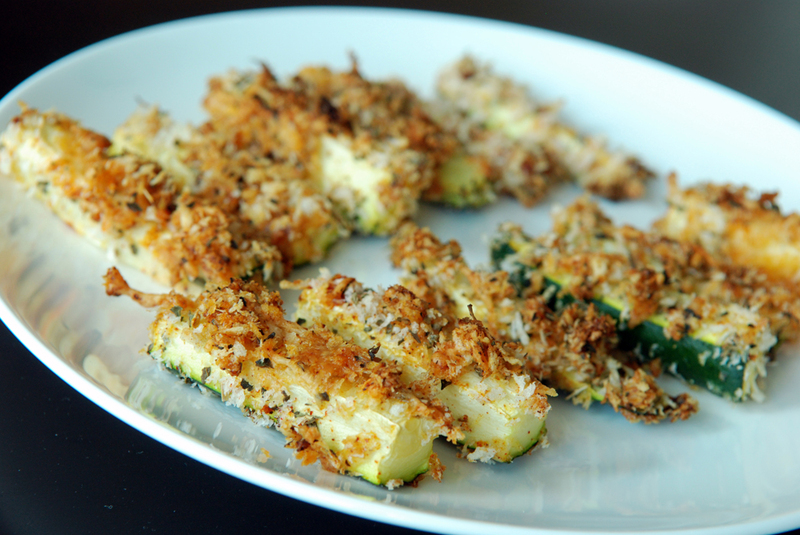 Zucchini is cut into sticks, coated in egg and dredged in Asiago cheese and (panko) bread crumbs mixed with smoked paprika and oregano. My Asiago cheese was freshly grated and I found it a bit difficult to stick to the zucchini when in a 1:1 ratio with the breadcrumbs, so I diluted it with more bread crumbs which helped. I liked the extra smokey flavour brought by the paprika into the crunchy coating. 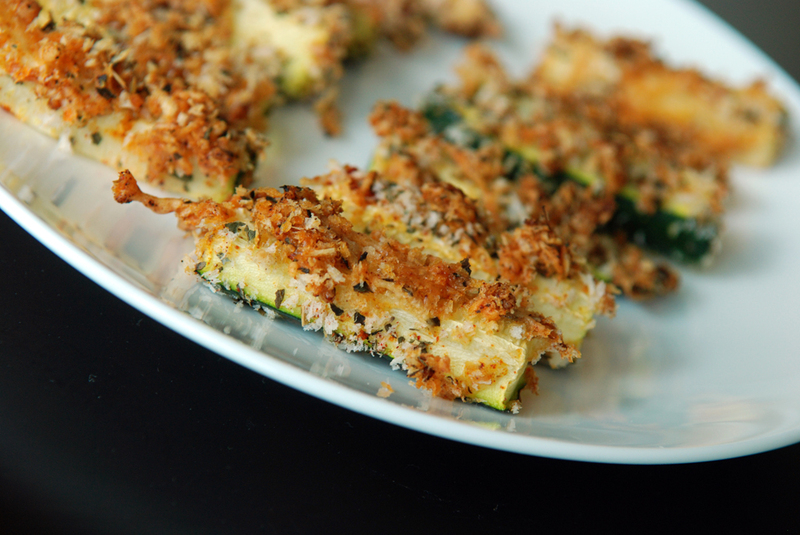 A bonus for this recipe is that the zucchini is baked, not fried. Perfect as a side, and if you make big pieces, great for dipping into a marinara or tzatziki sauce as a appetizer. This is my submission to Preeti’s Green Gourmet Event at W’Rite’ Food and my second submission to this week’s Blogger Secret Ingredient event, featuring Paprika, hosted by PreventionRD, and this month’s Side Dish Showdown. Dessert comes to my mind first when I think about rhubarb. 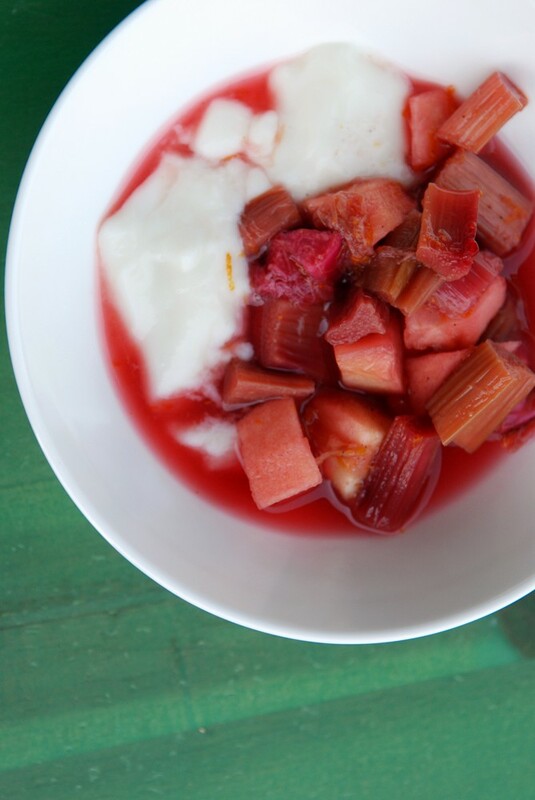 I have collected a multitude of sweet rhubarb recipes to try, but who says rhubarb needs to be paired with sugar as a sweet dessert? I stumbled upon an Indian-spiced rhubarb and lentil stew by Mark Bittman at the New York Times, and figured it would be a nice way to delve into Indian cuisine without worrying about curries and chilies. This was an interesting dish. I must admit that I am not gushing over it, because its mate that night was the baked rhubarb and apples with earl grey tea, cardamom and orange zest which truly stole the show. It had many complex levels of flavour, with the ginger and garlic, then the cardamom and cloves and finally little pockets of poached rhubarb. I didn’t really taste the mustard, though, despite modifying Bittman’s recipe to roast the mustard seeds first. It was different and I enjoyed it, which is most important. 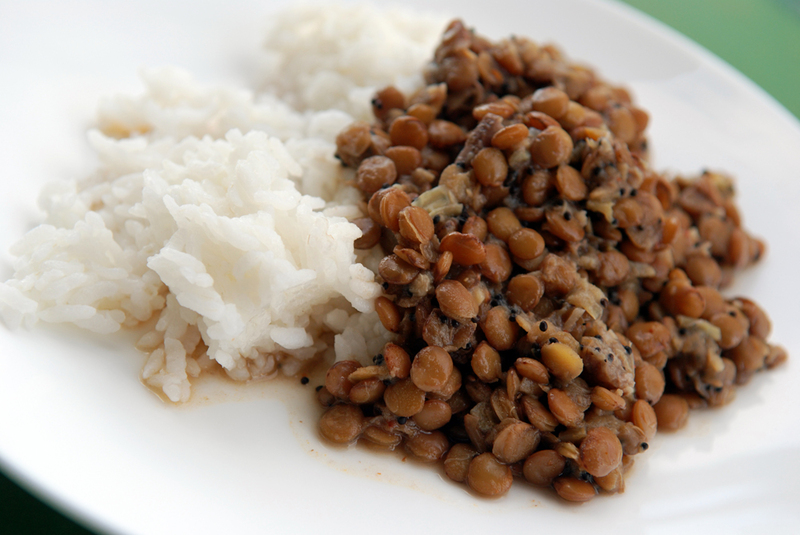 I served this with rice as a vegetarian entree, but it could also accompany an Indian-spiced meat dish. This is my savoury submission to Ricki and Kim’s SOS Kitchen Challenge, featuring sweet or savoury natural vegan cooking highlighting rhubarb this month, to this month’s My Legume Love Affair hosted by Diana at A Little Bit of Spain in Iowa and this month’s Side Dish Showdown. It is no secret that I love tea (in addition to visiting Penzeys when I went to the States, I came back laden with tea from Teavana). I only drink herbal and caffeine-free teas (er, tisanes) but I confess that I have one black tea in my collection. It is Earl Grey Cream. It brings Earl Grey with its hint of bergamot orange to the next level with vanilla and cream. It is also wonderful to incorporate into dishes while cooking and baking. I have used Earl Grey in delicious (and not as delicious) shortbread cookies and here it is paired elegantly with baked rhubarb. Let me preface this by saying this baked rhubarb is stupendously good*. It helps that it has a lot of my favourite flavours mixing sweet and sour perfectly. The rhubarb and apple are baked until softened, but not mush. Pick an apple that holds its shape, like Golden Delicious, Honeycrisp (one of my my favourite apples! ), Gala, Northern Spy, etc – unless you prefer apple sauce. The fruit is lightly sweetened and the flavours abound with citrus (lemon juice and orange zest) that complements the pool of Earl Grey sauce. Cardamom adds the finishing touch. Perfect! Bliss! I originally served it warm from the oven over chilled vanilla yogurt, and I am sure it would be delicious over ice cream as described by Chez Danisse where I found the recipe. 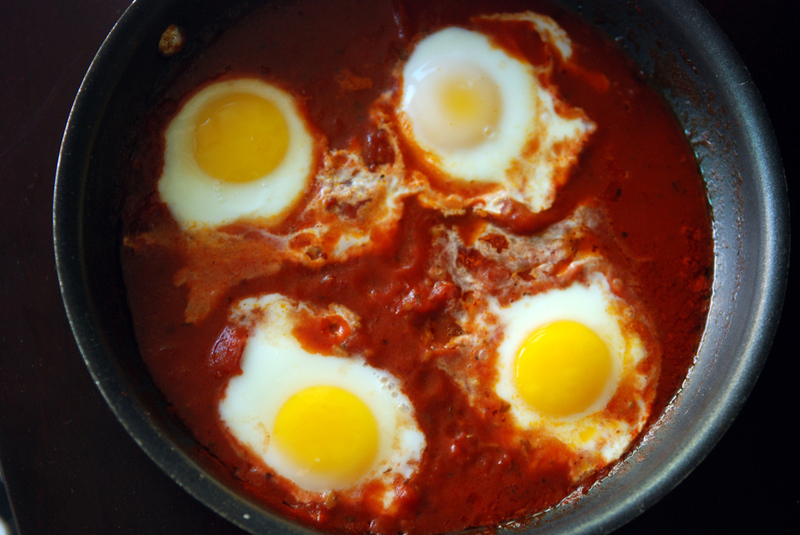 The next day, the sauce thickened slightly and was wonderful for breakfast with yogurt again, but also served over oatmeal. 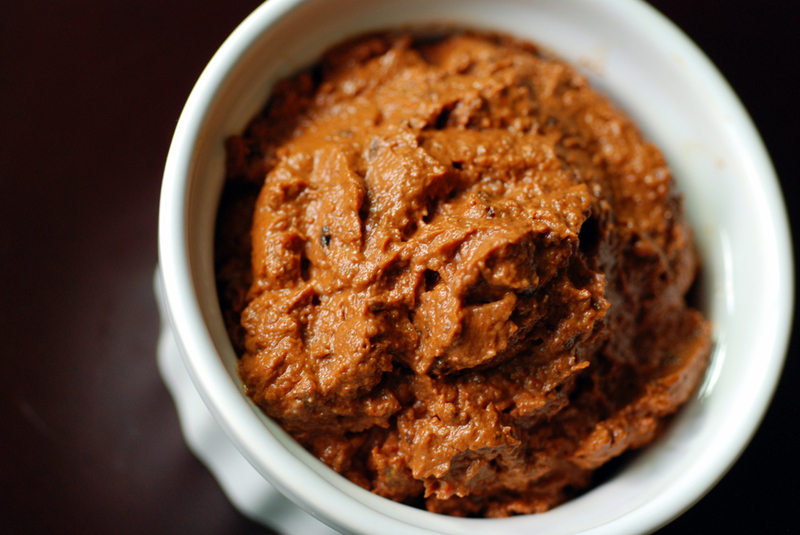 If you prefer more of a smoother sauce, zap it in the microwave for 2 minutes and it disintegrates into a thick sauce. This is my sweet submission to Ricki and Kim’s SOS Kitchen Challenge, featuring sweet or savoury natural vegan cooking highlighting rhubarb this month. PS. Does anyone know where to get a good decaf Earl Grey Cream tea that ships to Canada? Bonus if in Toronto! *It was so good that I called my mom past her bedtime (and past mine) to tell her how awesome it was. Thankfully I didn’t wake her up. It was also too late to share it with all of you, as I try not to photograph food without natural light. I knew I’d have to wait until the morning before I could snap some photos! Over the long weekend, I went cross border shopping. Yes, me, the Queen of Not Shopping (save grocery shopping, because I LOVE that! ), drove 5 hours to an outlet mall in Michigan. I bought some clothes, but one of my must-visit destinations was Penzeys, a spice store in Detroit. Aimee at Sugared Ellipses mailed me some small containers of various spices from Penzeys in the fall, and let’s just say I fell in love with them. I already needed a refill. I perused Penzeys’ catalogue and thought I knew what I wanted to buy. I thought! I never knew visiting a spice store could be that much fun. The difference with Penzeys is that there are so many different kinds of spices that you have to smell them to understand the differences. For paprika, did I want Hungarian, Californian or Spanish? Californian has the best colour but Hungarian the best flavour (who cares about looks anyways?, says the food blogger). Spanish is more all-around goodness. Thankfully someone was there to help me sniff every single one of them, and then again and even a third time, before I decided to stick with Hungarian paprika. But then there was other question – sweet or half-sharp? Sweet it was with its smokey flavour and my virgin palate. Hungarian sweet smoked paprika is definitely one of my new favourite spices because of its smokey full flavour without too much heat. I already used it in a spiced brownie but it was mixed with a few spices. This soup really lets the paprika shine. 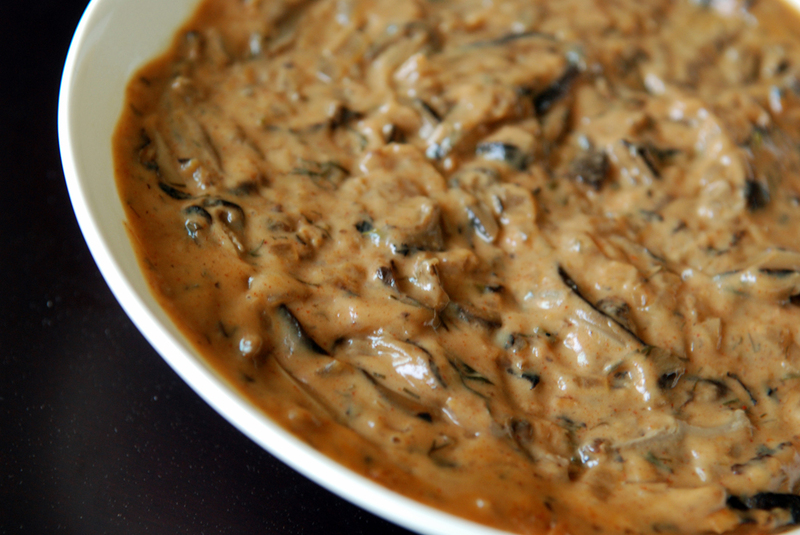 A creamy mushroom soup, without cream (wait, does sour cream count?) with a hint of fresh dill and the smokiness of the paprika really sets this soup apart from the pack. I really liked the soup with shiitakes, but that’s because I am a sucker for Japanese ‘shrooms. This soup was originally posted at Allrecipes.com, and posted by some of my favourite food bloggers. It was time for me to follow in their foot steps. This is my submission to this week’s Blogger Secret Ingredient event, featuring Paprika, hosted by PreventionRD. I am also sending this to Deb for this week’s Souper Sundays . One of the things I loved about Turkish cuisine was that despite the typically bland names of the dishes, they would be exquisitely delicious. 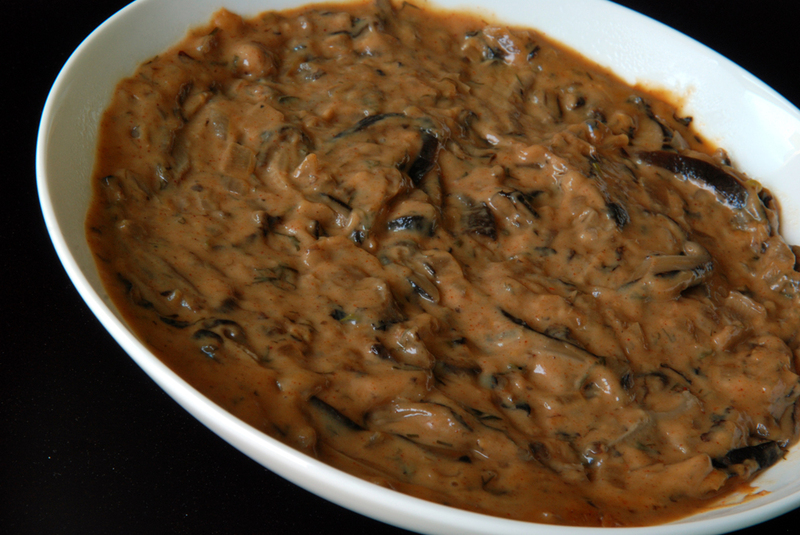 Eggplant in tomato sauce (patlican soslu)? It wasn’t boring at all! It probably only had a few simple ingredients, but it tickled my palate and make me want to eat more. Divine! While not Turkish, this is one of those incredibly delicious and flavourful meals where simple ingredients make something special. But the name of the dish is completely lackluster and almost puts me to sleep. 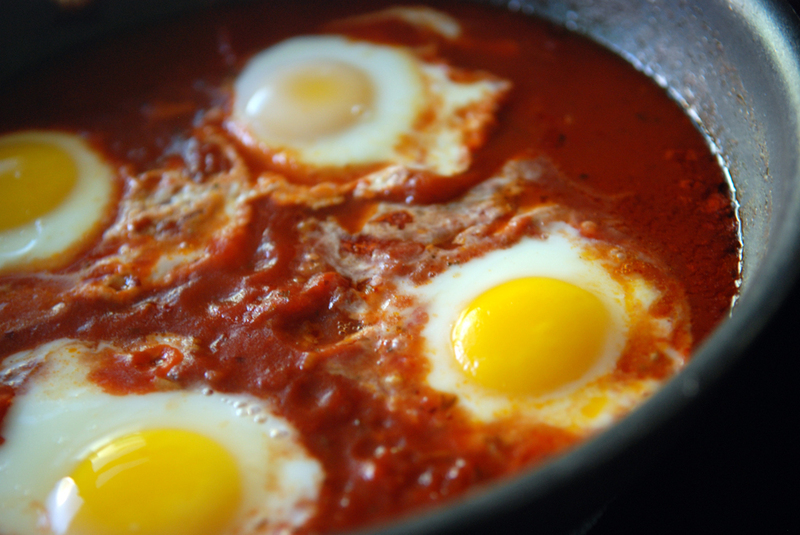 Eggs poached in tomato sauce? Um, yeah, no thanks…. 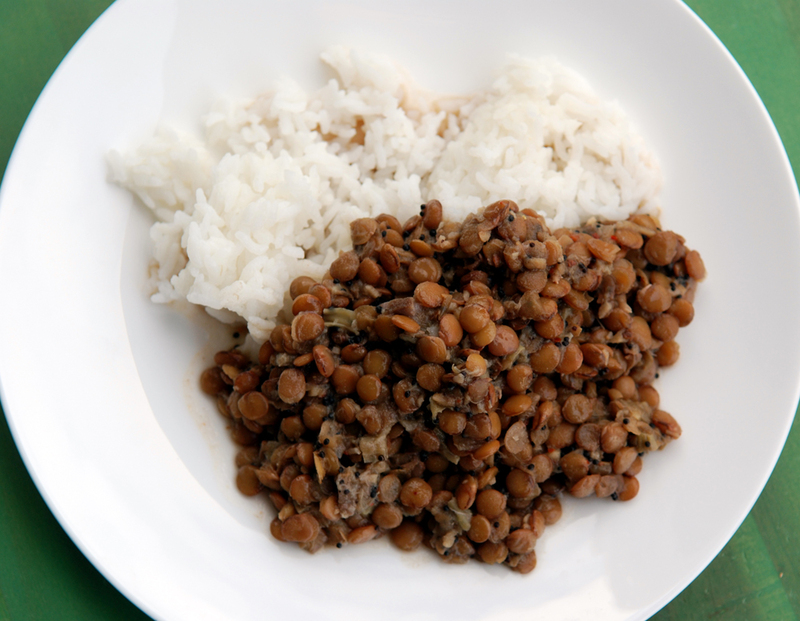 I am so glad I tried it, though, because it is easy, healthy and delicious. Of course, the reason I tried it was based on its high praise from the Smitten Kitchen, who was inspired from the Martha Show. 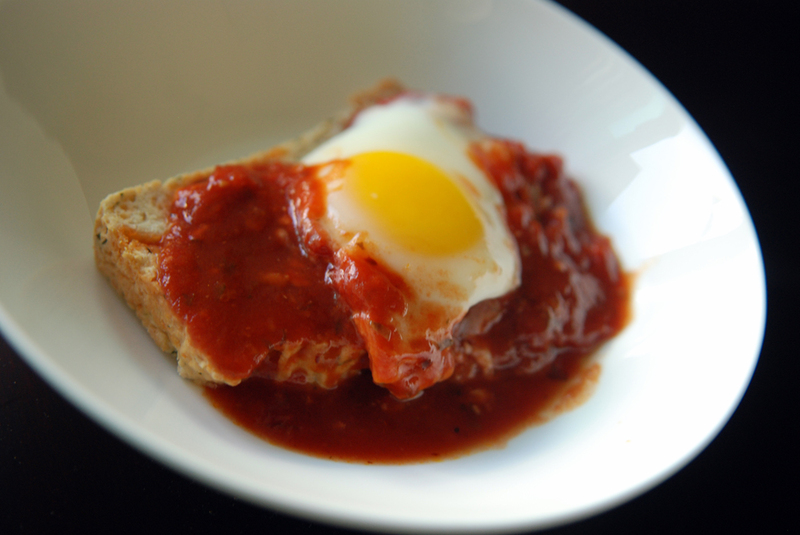 I tinkered with Deb’s recipe a bit because I couldn’t find cans of tomato puree and simply chopped up canned whole tomatoes and added in a tablespoon of tomato paste to thicken it a bit. 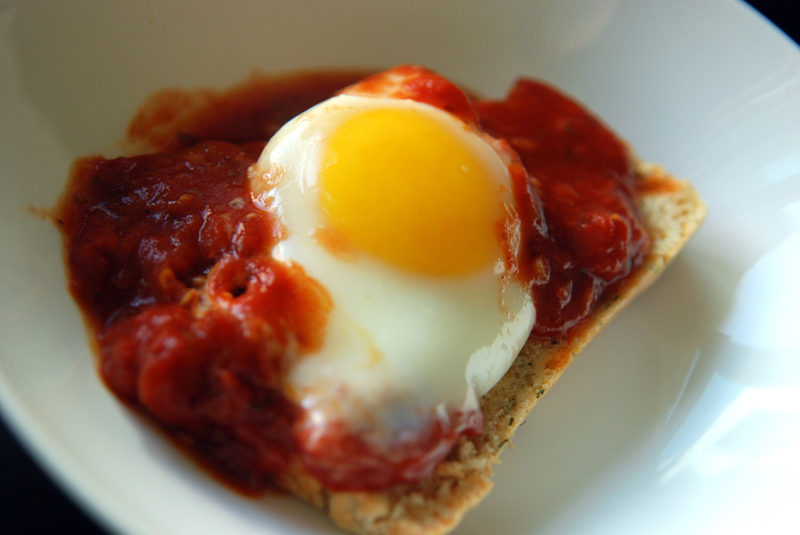 I originally served it as breakfast, and think it is a fabulous meal for brunch. It would also be appropriate for lunch or dinner with a side of vegetables. I certainly won’t complain if I eat this all day. 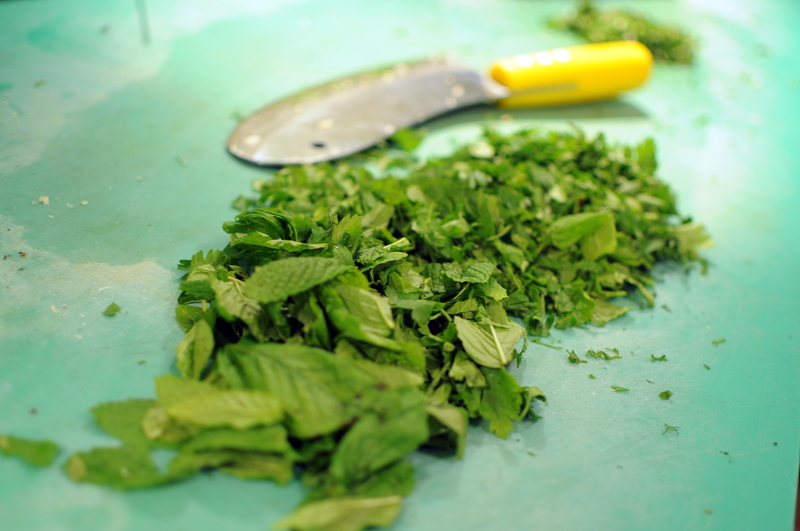 This is my submission to this week’s Weekend Herb Blogging hosted by Simona from Briciole.